Yes! You Can Video Record the Police! Here’s the deal: as a resident of the U.S.A. you have the right to record the police in the course of their public duties. The police don’t have a right to stop you as long as you’re not interfering with their work. They also don’t have a right to confiscate your phone or camera, or delete its contents, just because you were recording them. Had a citizen not recorded the shooting of Walter Scott, few of us would have likely heard a peep about that story. Despite some state laws that make it illegal to record others without their consent, federal courts have held consistently that citizens have a First Amendment right to record the police as they perform their official duties in public. The Supreme Court also recently affirmed that the Fourth Amendment, protecting citizens from arbitrary searches and seizures, means that cops need to “get a warrant” if they want to take your cellphone. And the US Department of Justice under Obama has affirmed the court’s stances by reminding police departments that they’re not allowed to harass citizens for recording them. The Post editor Marty Baron noted in his statement responding to the incident that the order to stop filming was illegal. Courts have held that, as a general rule, individuals have a right to record law enforcement officers carrying out their duties in public spaces. And as the video archive of questionable police tactics from citizen observers grows, it’s clear there’s a certain benefit to keeping a digital eye on the police: Knowing there is a record of their actions can help put everyone on their best behavior — or at least make sure there’s evidence of misbehavior when it occurs. Organizations like PINAC (photography is not a crime) have sprung up in recent years as well to educate people as well as share videos. In one recent article on PINAC a North Carolina police officer told a man he needed his phone as evidence before snatching the phone and trying to destroy it by slamming it to the ground. Many police stations have long recorded at least some of their officers’ interactions with the public, most frequently through dashboard cameras that capture traffic stops. Indeed, elsewhere in the world — such as Russia — car owners often purchase their own dashcams to gather evidence for insurance purposes and to record their interactions with the police and others. But there’s also a growing movement in the United States to have on-duty officers use body cameras to record their interactions with the public. Police officers in Rialto, Calif., started wearing cameras in February 2012. The result? The volume of complaints filed against officers fell by 88 percent compared with the previous year, and use of force by officers fell by almost 60 percent, according to the New York Times. The tactic adds an extra layer of accountability on police actions and creates a record that officers can fall back on if their account differs from that of an arrestee. I don’t think anyone would argue that the police should keep these recorded videos for an extended amount of time. If there are no flags or controversy then these videos should be erased likely after a week or two and only ones that get flagged should be kept longer. It seems like keeping a digital eye on the police can be a powerful tool for checking the power imbalance between citizens and the law enforcement agents who interact with them. So if a cop tries to tell you that you cannot video record as long as you are not interfering with the police they are wrong. THE ONLY way to keep the First Amendment as a right is to remind over-reaching authorities that it is there. Law enforcement absolutely can be videotaped and photographed as long as you do not interfere with policing. Be polite, but be firm. Calmly but firmly say that you are doing your job as a citizen journalist. Be respectful, but firm. Today, almost anyone with a phone is a citizen photographer or videographer. They are the eyes and ears, the reporters in a time of disappearing media. Full and freely obtained information is vital to democracy, and we must fervently remind those we employ in government of that precious right, which protects them, too. Courtesy of the ACLU. Taking photographs and videos of things that are plainly visible from public spaces is your constitutional right. That includes federal buildings, transportation facilities, and police and other government officials carrying out their duties. Unfortunately, law enforcement officers often order people to stop taking photographs or video in public places, and sometimes harass, detain or even arrest people who use their cameras or cell phone recording devices in public. Police officers may order citizens to cease activities that are truly interfering with legitimate law enforcement operations. In general, a court will trust an officer’s judgment about what is “interfering” more than yours. So if an officer orders you to stand back, do so. Police officers may not generally confiscate or demand to view your photographs or video or search the contents your cell phone without a warrant. In addition, it is possible that courts may approve the seizure of a camera in some circumstances if police have a reasonable, good-faith belief that it contains evidence of a crime by someone other than the police themselves (it is unsettled whether they still need a warrant to view them). You have a right to capture images in public places, but you don’t always have a right to record what people say. Different states have different laws so check your state law here. Conversations with police in the course of their duties are not private conversations, but many other things you may record on a public street are. 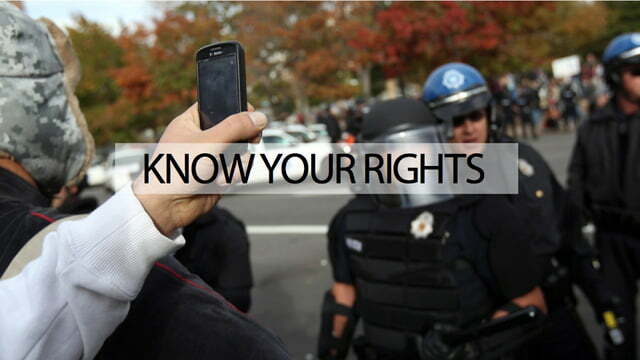 You have the right to videotape and audiotape police officers performing official duties in public. It is not a violation of most state Wiretap Laws to do so. That means you can record an officer during a traffic stop, during an interrogation, or while he or she is making an arrest. If you are detained, politely state that you believe you have the right to take pictures or video and that you do not consent to the officer looking through or deleting anything on your camera. But if the officer reaches for your camera or phone, do not resist. Simply repeat that you do not consent to any search or seizure. You don’t want to invite a charge for “resisting arrest.” Police use “resisting arrest” now as their free pass to arrest you even though you have done nothing wrong to be arrested for. It should at many times be called the contempt-of-cop law instead. Once you resist arrest then you are doing something wrong so just cooperate and file charges against the wrongful arrest later. Here is a great guide on filing an official complaint. Remember, citizens must assert their state and federal constitutional rights or we will soon forget they even exist and so will the police.